We at UCView are excited to introduce our partnership with Samsung. Samsung Tizen Smart Signage displays are powered with UCView technology which provides the ability to connect a Samsung display directly to UCView Server without the need for a separate player. Managing digital signage has never been easier or more empowering, thanks to this all-in-one SSSP platform that essentially replaces an external media player with a SoC-based app. 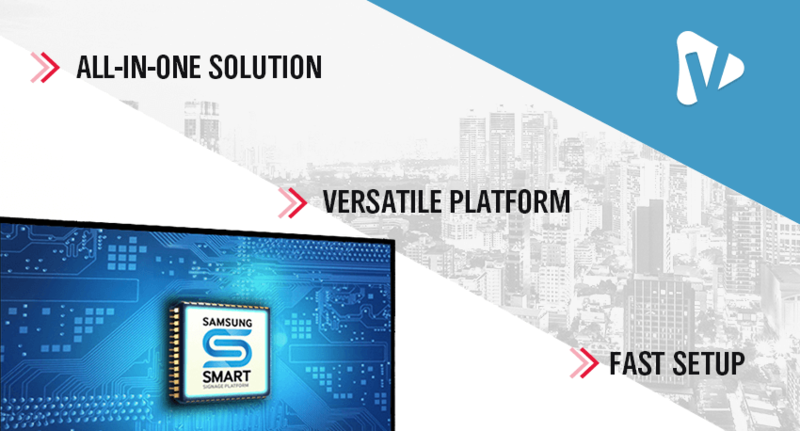 The Samsung Smart Signage Platform (SSSP) is an open-source all-in-one solution that is embedded in Samsung SMART signage and doesn’t require any additional devices to play content. UCView has been providing unparalleled digital signage solutions to our wide range of customers in all applications and industries. We are excited to be partnering with Samsung to bring you the new era of digital signage. Utilizing Samsung’s innovative SSSP technology, we are now able to deliver our most robust digital signage experience yet. Samsung Tizen Smart Signage displays have all the necessary built-in media codecs to display Videos and various media types such as HTML5 in a variety of formats. This drastically reduces setup and hardware costs as well as increasing network security by limiting points of failure. Samsung Smart Signage displays come in many sizes ranging from 32” to 85” and include the revolutionary SoC (system on board chip). We have already deployed our SSSP Solution at numerous industries across the world and are excited in continuing to move digital signage innovation forward.